According to a Chinese proverb, there are two ways to enrich your life. One is to read 10,000 books. The other is to travel 10,000 miles. 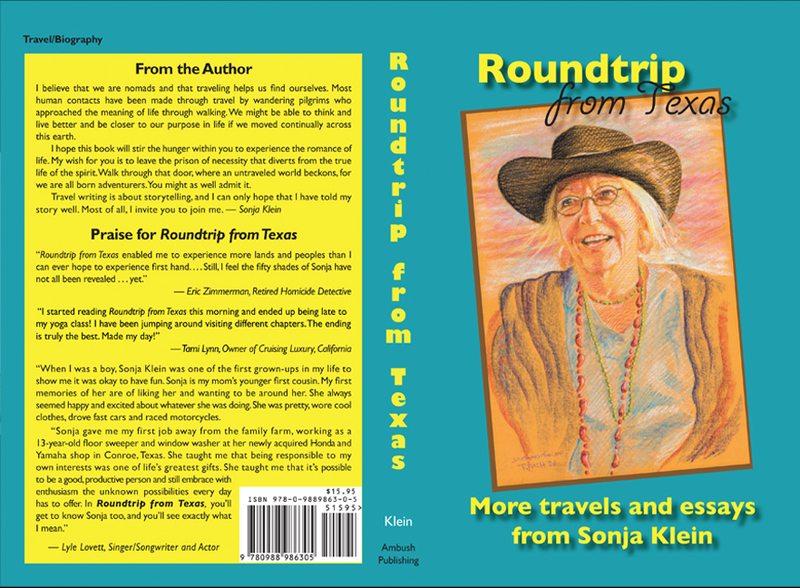 “Roundtrip from Texas,” Sonja Klein’s fun new “travelogue” lets you travel those miles in a single book. Nobody could ask for a cooler traveling companion. Klein, author of “Honk If You Married Sonja,” is a globetrotting hoot. The fifth-generation Texas rancher, and cousin of singer-songwriter Lyle Lovett, recounts her journeys to everywhere from Uruguay to Zanzibar with a refreshingly candid voice that adds one or two dimensions to even the most exotic locales we travel to with her. Did you know that Porto Bello Brazil is the Underwear Capital of Brazil? Or that a mature lobster carries more than 100,000 eggs? Klein, a connoisseur of fine factoids, is pleased to inform us that porches are painted blue in Charleston, South Carolina because wasps and hornets won’t nest on that color, and that the words, “hammock,” “barbecue,” and “hurricane” come to us courtesy of the native languages of Brazil. But the real treat in “Roundtrip From Texas” is the food. Klein, a self-confessed food fanatic, describes her meals in loving detail, from the crisp sea bass, bean mili-melo, and citrus fondue of halifax, Nova Scotia to the Peking duck delicately roasted, sliced, and served with thin crepes in Beijing. Food has meaning. We learn that sliced watermelon in China signifies the end of the meal. Where we go with her (Klein visits 20 countries in Roundtrip from Texas), the aromas of that culture’s cuisine waft from the pages. Sonja Klein, who’s won an award or two for her Texas cooking, stokes our appetite for food and adventure. Part international traveler, part Texas hill country rancher, Sonja leads a colorful life ( husband number two was a bank robber and enforcer for the mob) and is always part of the scenery wherever she goes. And that-when the sliced watermelon is served- is what makes “Roundtrip from Texas” such an enjoyable journey.